How Did Dribbble Succeed in Building a Strong Designer Community? In the world of platforms there are various companies that are built around professional communities or simply groups of people who share common interests and hobbies. 500px is a platform for professional and aspiring photographers, Upwork is a platform where freelance specialists – from translators to mobile app developers – can find new clients. Dribbbble is one of the most populated online communities for designers and illustrators. Designers use Dribbble to find inspiration, request feedback from the professional community and look at their peers’ new projects. 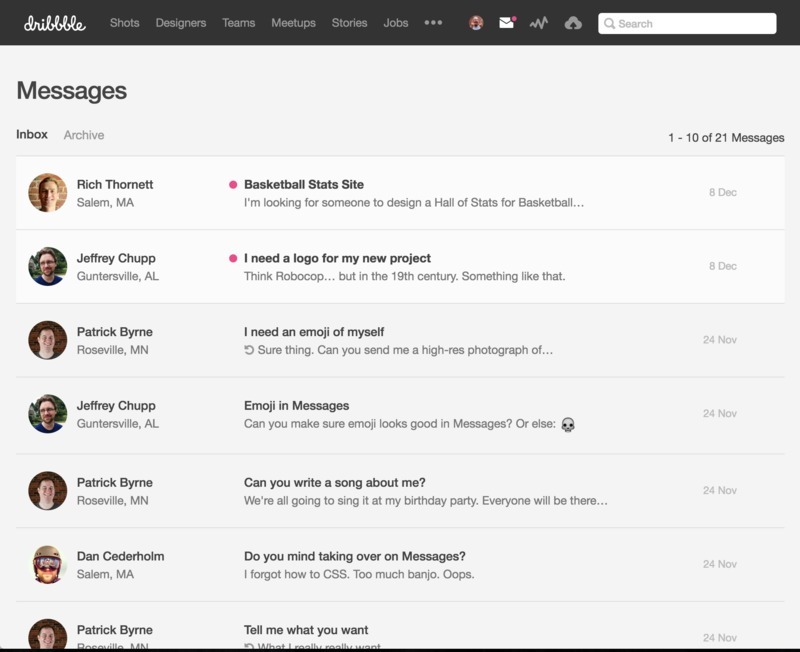 Dribbble is not the first platform that attempted to create a designer community. DeviantART and Behance tried to create similar environments in the past, but they weren’t nearly as successful. Understand the motivations of your creators who will supply the content. Create an environment and provide a stack of technologies that facilitate content creation. Develop a strategy to grow the number of participants on the platform. Platforms for creatives such as 500px, Behance, and Dribbble set themselves apart by mostly targeting professionals. Let’s look at how Dribbble promoted their platform and built a devoted community using Choudary’s three methods. What is Dribbble's secret for attracting users? 4) the community fulfills their needs. Users join successful online platforms for one or a combination of these reasons. Dribbble’s consistent growth may seem random, but in reality it is the result of a thoroughly planned strategy that helps Dribbble convert their first-time visitors into devoted users. Why do users come to Dribbble? Producers (designers) come to share their work, get feedback, and discover new sources of inspiration; consumers (companies) come to find designers for their projects. Dribbble is as a place where professionals constantly respond to each other’s portfolios by upvoting each other’s works and leaving feedback, thus increasing the value of the platform itself. Designers are interested in joining this platform because its reputation strengthens their personal brands, and companies are happy to participate because they get a curated selection of the best designers all in one place. Designers are also attracted by the fact that 600×400 ‘shots’ are small and manageable, and posting works on Dribbble doesn’t require as much time and effort as creating projects for Behance. Dribbble’s creators say that they were not intending to focus on sports metaphors so much, but their users really took to it. The company’s logo and the name of the platform itself are also all about basketball. Dribbble is visually appealing, particularly because they focus on making high-quality design projects that stand out against a simple interface. The site’s color scheme includes grey and black with a touch of pink (in the Dribbble logo). Projects themselves are positioned in the center with plenty of space around them – free for comments and statistics about the number of likes and views for each shot. What does Dribbble offer their users? We’ve already talked about different ways to scale a platform, and some of the principles we talked about clearly apply to Dribbble as well. So what are the secrets to their popularity? Dribbble markets itself as an ‘exclusive site,’ by requiring an invitation from a current member in order to join. This differentiates them from their competitor Behance, and results in more curated content. Also, restricting access to the platform can be seen itself as part of their marketing strategy: the air of exclusivity makes people want to be members. Since 2009, Dribbble could have grown way beyond their current size, but they’ve opted instead for quality of content over quantity of members. Dribbble has a variety of content. Members share all kinds of projects from web design to illustrations. This means that Dribbble accommodates a wide range of design professionals. Dibbble doesn’t allow sponsored images in the community, and they don’t bother their members with pop-up notifications and ads. Dribbble’s members appreciate the community's comfortable environment. Dribbble doesn’t charge their members for access to the platform, which is why they achieve a strong network effect. To make money, they charge companies that want to find designers through Dribbble for posting job listings on the platform. We’ve written before about how to successfully scale a platform, and one way to ensure more members join a platform is to provide them with built-in tools that facilitate core interactions on the platform. In the case of Dribbble, they created their own job boards which all users can access to find employment. Dribbble’s job board is simple and looks like a database of links, but it is as a reliable source of vacancies for many design professionals. Some platforms are released without a clear understanding of how they can scale. And Dribbble – as successful as it has become – was no exception. At first, they didn’t have any features that would allow users to post job listings, but they had banners that companies would buy to post ads on their website. Eventually, the majority of banners were occupied by job ads. Dribbble took the opportunity to create a dedicated space where companies could hire designers after they inspect their works. This business model provides incentives for both producers and consumers of the platform’s content: designers are motivated to put up examples of their best work and constantly updating their portfolios, while companies can get access to the best professionals in the field. Better still, the portfolios of these specialists have already been reviewed by their peers. Looking back, we can identify a point in time when Dribbble became the online equivalent of an American sports team. Everyone who was in the field wanted to be part of it. It was a cool place to be featured. And Dribbble made sure to only accept the best of the best, so being a member of the platform meant respect within the professional community. Later, Dribbble became more open, though new members still have to be approved. But by the time Dribbble changed their rules, the platform already gained the necessary traction and earned a reputation as a place that offers high-quality content. These days, Dribbble is a thriving professional community known for its high quality of content and its active participants. Dribbble is as an example of a platform that scaled successfully and built a strong community of users while helping both producers and consumers reach their respective goals.